A shot for psoriasis is the method of treatment for patients with moderate to severe symptoms. Psoriasis is a chronic disease and the outbreaks you experience can be mild to severe. If you have psoriasis, your doctor will determine the best method of therapy after diagnosing your condition and assessing the severity. Communication with your doctor is critical especially when you are using biologics, those medicines given through injections. Doctors start with the mildest form of therapy and gradually increase the strength of the medication to combat your symptoms. When you start a new form of therapy always keep your doctor informed when your condition worsens, improves or you experience side effects no matter how minimal the side effects seem. Drug manufacturers make biologics from natural sources including sugars, proteins and different combinations of these products as well as living organisms such as cells and tissues. Medical professionals administer the immunomodulator drugs through intravenous infusion, subcutaneous or intramuscular injection on the arms, abdomen or legs. A shot for psoriasis is for people who do not respond well to conventional medications. Even though natural sources are used to create the drugs, they carry very serious side effects. If you use any of these biologics and you experience the slightest side effect, call your doctor immediately. Before you start this therapy, your doctor will screen you for latent TB infections by performing a TB skin test or a chest X-ray. If you have TB, you cannot begin these medications until you complete treatment for the TB. Stelara targets interleukin-12 and 23 the proteins that your immune cells produce and thought to have a role in psoriasis. It is a human monoclonal antibody and it stops these two proteins from attaching to cells in your body. The result is it slows the body from producing more skin cells and improves your psoriasis and the inflammation associated with it. Your health care provider administers Stelara as a shot for psoriasis under the skin. The treatment starts with two starter doses on week 0 and week 4, and four doses within a year every 12 weeks. The dosage is based on your weight starting at 45 mg for patients under 220 lbs. and 90 mg for those over 220 lbs. The side effects include upper respiratory infection, headaches and fatigue. Enbrel treats moderate to severe plaque psoriasis as well as different forms of arthritis including psoriatic arthritis. It blocks a chemical messenger called tumor necrosis factor-alpha or TNF-alpha in the immune system. This chemical signals cells to cause inflammation and patients with plaque psoriasis have too much TNF-alpha. Enbrel reduces TNF-alpha in your system and disrupts the inflammation, which improves your psoriasis. You can administer this shot for psoriasis at home with an injection under the skin. The dosage is 50 mg twice a week for three months with a maintenance therapy of once a week thereafter. Some of the side effects of Enbrel include headaches, stomach pain, sore throat and dizziness. Initially the Food and Drug Administration approved Humira for rheumatoid arthritis, then, in 2008, made it available for psoriasis. It works like Enbrel by blocking TNF-alpha and reducing the inflammation associated with psoriasis. If you have moderate to severe psoriasis you can take Humira. It is injected under the skin with an 80 mg dose on day one and a 40 mg dose every other week starting on the eighth day. Your doctor will monitor your progress and determine the length of your therapy, but Humira is designed for continual use. Side effects include rash, injection site reactions and urinary tract infection. Remicade is another TNF-alpha blocker originally approved for arthritis and later approved for psoriasis. Your doctor can prescribe Remicade if you have moderate to severe psoriasis to reduce inflammation and reduce lesions on your skin. Unlike those medicines given as a shot for psoriasis, Remicade is infused beginning with a starting dose of 5 mg per kilogram or 2.2 pounds of body weight. The therapy continues with three infusions in the first six weeks and after that you get an infusion every eight weeks or as prescribed by your doctor. Administered intravenously, the infusion takes about two to three hours to complete one treatment. Side effects include upper respiratory infections, headache and infusion reactions. 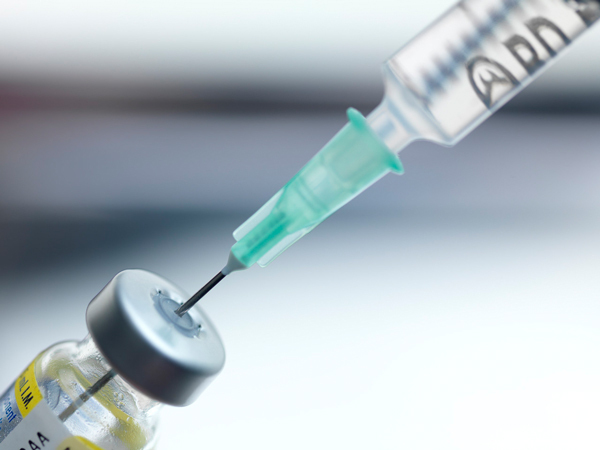 The decision to begin invasive treatment such as a shot for psoriasis is a serious one. Optimally, natural and topical remedies are the preferred courses of treatment but instances do occur where they are not effective. Be an informed consumer and discuss thoroughly all options with your doctor before starting any course of treatment.